Dr. Kristin Reimann has always been fascinated by medicine, and initially thought she wanted to go to school to treat human patients. When she realized she preferred not to work in the niche fields that human physicians specialize in, something else came to mind: why not combine her passion for science with her love of animals? Now, Dr. Reimann is an Associate Veterinarian here at Golden Valley Animal Hospital. Dr. Reimann grew up in Wayzata, Minnesota and attended Northwestern University in Illinois for her undergraduate studies. During her senior year there, she began working at the Anti-Cruelty Society, the largest animal shelter in Chicago, as well as at the Brookfield Zoo. 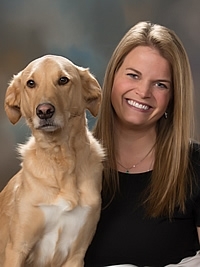 After graduation, she started working as an assistant here at the clinic, then began veterinary school at the University of Minnesota’s College of Veterinary Medicine. The best part of her job, says Dr. Reimann, is the relationships she gets to forge with pet owners. Above and beyond her love of medicine, the people she serves are her reason for coming to work every day. Dr. Reimann and her husband live in Orono with their two children, Leo the family dog, and a pair of cats named Francis and Ava. When she isn’t caring for pets around the clinic, Dr. Reimann enjoys boating in the summer and skiing and sledding during the winter months. She’s also fond of going to the zoo and aquarium with her family.